Aodh Ruadh's under 10 hurlers took part in a blitz hosted by Setanta, playing five games in all, against teams from Gaoth Dobhair, Saint Eunan's and Burt. All the players put in a great effort winning three, drawing one and losing one of their games. It was one of the warmest days of the year so far and after getting of to a slow start they pulled themselves together and showed what they could do when they put in the effort. Thanks to all who help with the transport and during the blitz, all the players had a great day. 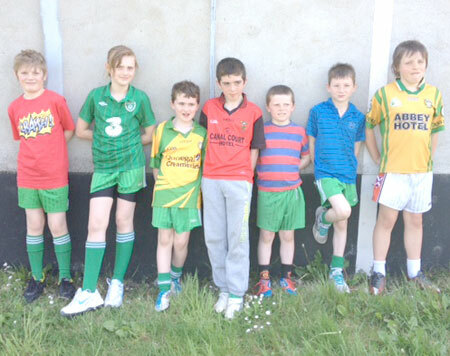 Below is a picture of the players who attended the blitz, from left to right, Corey Ryan, Grace O'Sullivan, Ryan Keenaghan, Senan Rooney, Aaron Horan, Callum Ayers, and Peader McHenry.